T-Mag offers its signature line of magnetic drive pumps along with booster pumps, circulator pumps and end suction pumps. The company features its AM and AMX series mag drive pumps. These pumps are built for transferring acids, alkalis, hydrocarbons, heat transfer oils, liquid gases, toxic and explosive chemicals in industrial and chemical industries. They are also used to move low viscosity surfactants, acids and CIP chemicals in pharmaceutical and cosmetic industries. The T-Mag AM Series is a sealless centrifugal mag drive pump with flow capacity to 26 gpm and max head to 32 ft. The pump is available in 1/12, 1/4 and 1/3 HP sizes. 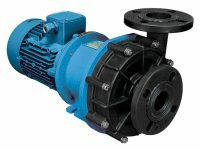 The pump is a compact design and built for low flow applications. 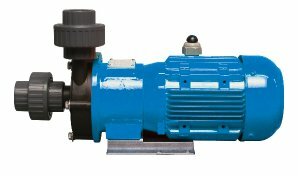 The AM Series pump is available in several casing materials including PVDF, carbon-filled reinforced ETFE, and glass filled reinforced polypropylene. Additional material options are also available for elastomer and connections. T-Mag’s AMX Series sealless mag drive pump utilizes the latest heat dissipation technology and six horsepower ratings to choose from to handle some of the highest flow rates in the industry. The pump can handle flow rates up to 215 gpm and total heads up to 92 ft. The pump is available in six sizes including 1/2, 1, 2, 3, and two 5 HP options. Several materials of construction are available to fit almost any application including Polypropylene and ETFE. The AMX Series pump is built to increase productivity and reduce operational costs. The T-Mag Magnetic Drive Pumps headquarters are located in Brookfield, WI. With over 30,000 square feet of warehouse and manufacturing space, we are ready to serve the US and Canada for all of their magnetic drive pump and accessory needs. T-Mag pump technology has been redefined over the last three decades, with numerous product patents; T-Mag has become a standard in reliability. T-Mag Magnetic Drive Pumps has earned the reputation for providing innovative, cost-effective solutions to our valued customers. This reputation is built on a foundation of quality products, comprehensive service and our unparalleled commitment to customer satisfaction. Our core competencies include fluid system design incorporating industrial pumps, hose & fittings, heat exchangers, mechanical seals, mixers, filtration, integrated systems, and parts & accessories. Our extensive inventory allows for same day shipments and emergency replenishment to minimize downtime. T-Mag Magnetic Drive Pumps subscribes to the Six Sigma methodology. The fundamental objective of the six sigma methodology is the implementation of a measurement-based strategy that focuses on process improvement and variation reduction. This creates a measure of quality that strives for near perfection by improving our efficiencies in any process - from manufacturing to transactional and from product to service. Our entire organization is committed to improving our core processes, resulting in an improved customer experience. From sales and customer service to engineering and fabrication, our commitment is to exceed our customers expectations.